Well doesn’t time fly when you are having fun. 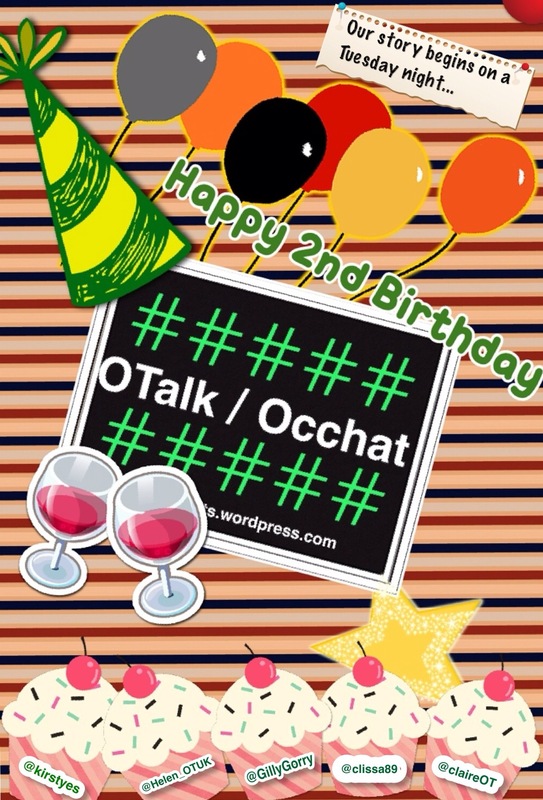 Who would have guessed that #OTalk is 2 years old today! Please share with us your favourite memory of #OTalk from the past two years. Thought we would share the submission article which was published in OTNews October 2013. Thank you to the wonderful OTalk Community. You are fab, looking forward to another great year. Since November 2012, when OTNews first reported on the #OTalk community (OTN 2012), our online community of practice has gone from strength to strength. For example the last ten months have seen the #OTalk hashtag generating 14,575,845 impressions and 10,515 tweets from 718 participants. The benefits of engaging and developing a community of practice have been highlighted across a range of publications and events, including Patients First and Foremost (DOH 2013) which cited #OTalk alongside #WeNurses as Actions for Cultural Change. The BAOT Eastern Regional Group invited the #OTalk team to present about professionalism online and to run a social media surgery at their study day in May 2013. May also saw Elaine Hunter guest host an #OTalk in preparation for her Elizabeth Casson Memorial Lecture (Hunter 2013a). We were delighted to have our poster exploring the development of online communities of practice (OTalk 2013a) accepted for the 2013 COT conference. This was only overshadowed by being cited by Elaine Hunter during the Elizabeth Casson Memorial Lecture (Hunter 2013b) in which Elaine discusses transformational leadership and refers to her experience of #OTalk as a real world practice example. The #OTalk team always strive to remain responsive to the community’s wishes, which we believe will ensure that #OTalk is constantly developing and moving forward. This has resulted in recent changes with the hashtags previously used, #OTalk and #Occhat, now being combined and #OTalk used every week. This was implemented to simplify things for new members, however there is still a commitment to continuing discussions focused on aspects of occupational science (which were previously held using #occhat). Another exciting development has been the introduction of a Journal (Media) Club, the format of which has been decided based upon a survey of the #OTalk community. The launch event on 3rd September 2013 received an enthusiastic response from the community (OTalk 2013b). The Journal (Media) Club will provide a mixture of topics, selected and hosted by the community. We are astounded to report we already have hosts confirmed until August 2014! A twitter chat will be held the first Tuesday of each month using the #OTalk hashtag from 8-9pm. However, a new development is for the discussion to have started via the blog comments feature for the preceding month. Thus providing the opportunity to engage at any time and not being limited to 140 characters, or familiarity with twitter. The tweet chat will be used to sum up discussions and introduce the next topic. As usual, the #OTalk team are happy to support existing or new members of the community with all aspects of engagement. Please tweet us @OTalk_Occhat, or individually if you prefer: @Helen_OTUK, @GillyGorry, @kirstyes, @Clissa89 or @Claireot. DOH (2013) Patients First and Foremost: The Initial Government Response to the Report of The Mid Staffordshire NHS Foundation Trust Public Inquiry, Department of Health, London. Hunter EP (2013a) Making the invisible visible (blog). Available at www.elaineahpmh.wordpress.com. Accessed 08.09.2013. Hunter EP (2013b) The Elizabeth Casson Memorial Lecture 2013: Transformational leadership in occupational therapy – delivering change through conversations. British Journal of Occupational Therapy 76(8), 346-354. OTalk (2013a) Levelling the Playing Field: Developing Online Communities of Practice (blog). http://otalkocchats.wordpress.com/2013/06/10/cot-poster-2013-otalkontour/ OTalk. Accessed 08.09.2013. OTalk (2013b) Journal (Media) Club Launch (blog). http://otalkocchats.wordpress.com/2013/08/31/otalk-3rd-september-2013-journal-media-club-launch/ OTalk. Accessed 08.09.2013. OTNews (2012) Talking the #OTalk. OTNews, 20(11), 42. Please be mindful of your code of ethics / confidentiality and professionalism as we kick off this evenings #OTalk. #OTalk would like to say a big hello and thank you to @Richardsblister for hosting this evening. OT and veterans with PTSD. Say hi to Karen. Good Evening #OTalk looking forward to an interesting chat…..
@Richardsblister take care…. #OTalk those spider are leggy! #otalk hi all! I’m awake!! @Richardsblister yes we are #OTalk are you? #otalk In Wales if vets just have PTSD they go to primary MH veterans service. If they have SMI also they will come to the CMHT. rest of UK? @clissa89 @danielleb_90 @OTalk_Occhat #OTalk Seen PTSD symptoms in non-combat but unless the ind is v suicidal, usually no admission. @clissa89 @danielleb_90 @OTalk_Occhat #OTalk Also statistically have much! more inds diagnosed with schizophrenia and bipolar disorders. @peapodicus try to remember #OTalk so all can see your tweets. @pluminmouth every Tuesday at 8pm is #OTalk. #OTalk RT @peapodicus: old fashioned and unhelpful. any opportunity to do work directly with army, mental wellbeing/recovery etc? @Richardsblister #otalk Ive still got the self control in that regard but Ive lost my aggression. @Richardsblister @OTalk_Occhat #otalk so possibly more senior ranking soldiers masking trauma whilst dealing with more trauma..
@Richardsblister @BoothRach #OTalk I agree it’s one of the issues: communication. There’s also lack of general awareness re PTSD. @Richardsblister #OTalk Could not agree more! hi all #OTalk is it true that it is now considered harmful to do debrief counselling soon after the event? #otalk @BoothRach as a soldier you are trained not to be weak, as some will know they are described as having a sick sense of humour. RT @JulieHughes2013: hi all #OTalk is it true that it is now considered harmful to do debrief counselling soon after the event? @HarryStarkPhD @OTalk_Occhat #otalk i guess many veterans particularly may feel a civilian couldn’t understand? @peapodicus @HarryStarkPhD @OTalk_Occhat #otalk Most soliders ok with civvies. As long as you are good at what u do. @Richardsblister #Otalk I like this concept of processing and recalling, or not, difficult sensations. @Richardblister #OTalk any link between sensory processing disorder and PTSD? @OTalk_Occhat @Richardsblister #OTalk Any additional resources to google/links? @Richardsblister #otalk does using MOHO help vets understand difficulties? The Transition from Soldier to Civilian http://t.co/ytqxkozcIg #otalk my blog. its a bit political lol .but have a read anyway. @Richardsblister #otalk . yeah. it only short though. #OTalk Next week same time same place… we are chatting vocational rehab! Yay, blog post to follow shortly. @Dai2584 #OTalk Thanks for posting this. Whether political or not, it’s always useful to read personal experiences to get a realistic pic. RT @OTalk_Occhat: #OTalk Next week same time same place… we are chatting vocational rehab! Yay, blog post to follow shortly. What was s the subject of #OTalk yesterday? So busy we missed it! @Dai2584 Beginning new work here veterans and with two OT veterans in team, we are lucky #OTalk.